Calling L4, L5 and L6 students – win £50 for your views on university! Here is an opportunity for all undergraduate students to tell us what you think of your time at university, and get entered into a draw to win a £50 voucher at the same time! 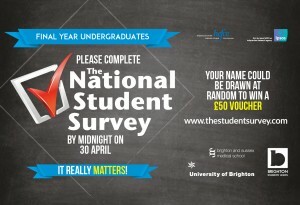 If you’re a Level 6 student you need to fill out the National Student Survey to get entered into the draw – and you’ve got until Midnight of 30 April to do it. You can do this right now by clicking on the black/grey NSS poster below. 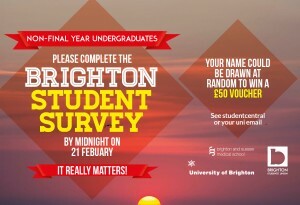 If you’re a Level 4 or Level 5 student you need to fill out the Brighton Student Survey. You’ve got until midnight on 21 February to do this, so you’d better get your skates on! All the info is on Studentcentral – click the red/orange BSS poster below to go to studentcentral and get started!